Black Lives Matter vs. the LAPD: Are the Police Unfairly Targeting & Surveilling the Movement? | Democracy Now! Black Lives Matter vs. the LAPD: Are the Police Unfairly Targeting & Surveilling the Movement? criminal defense and human rights attorney who represents Black Lives Matter-Los Angeles. She is a professor of Pan-African studies at California State University, Los Angeles. She represents six Black Lives Matter activists on trial in Los Angeles for blocking the 101 freeway in November 2014.
organizer with Black Lives Matter. She is also a professor and chair of Pan-African Studies at California State University, Los Angeles. Prosecutors in Los Angeles are determining whether to retry six Black Lives Matter activists whose trial recently ended in a hung jury. The six face misdemeanor charges for barricading the 101 freeway in Los Angeles in November 2014. That action was in response to the non-indictment of former Ferguson, Missouri, police officer Darren Wilson in the killing of Michael Brown three months earlier. Activist Rosa Clemente was also tried but was acquitted. Supporters say the prosecution is part of a larger effort by the LAPD and City Attorney’s Office targeting Black Lives Matter activists in Los Angeles. 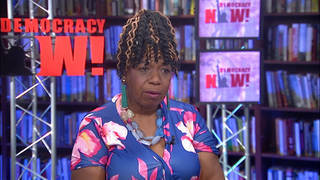 Melina Abdullah, an organizer with Black Lives Matter-Los Angeles, describes how many protesters facing charges were under surveillance and how some had letters sent to their homes from the LAPD and the U.S. Justice Department. Abdullah is professor and chair of Pan-African Studies at California State University, Los Angeles. We also speak with Nana Gyamfi, a criminal defense and human rights attorney who represents Black Lives Matter-Los Angeles. AMY GOODMAN: This is Democracy Now!, democracynow.org, The War and Peace Report. I’m Amy Goodman. We are on the road as part of our 100-city tour, just begun, in our sixth city, Los Angeles, where prosecutors here are determining whether to retry six Black Lives Matter activists whose trial recently ended in a hung jury. The six face misdemeanor charges for barricading the 101 freeway in Los Angeles in November of 2014 in response to the non-indictment of the former Ferguson, Missouri, police officer Darren Wilson in the killing of Michael Brown that had happened three months earlier. Activist Rosa Clemente was also tried, but was acquitted. Supporters say the prosecution is part of a larger effort by the LAPD and City Attorney’s Office targeting Black Lives Matter activists here in L.A.
NANA GYAMFI: This is a case—and thank you so much for having me on this morning. This is a case in which we really see the Los Angeles Police Department and the city attorney join forces to suppress and repress the speech for black lives on behalf of the Black Lives Matter movement in Los Angeles. We had a national day of protest, which occurred not just in Los Angeles but all over the country, three days of protests right before Thanksgiving in 2014, in which Los Angeles arrested over 330 people, the largest number of arrests in any city. If you think back, Amy, to all of those people in New York City, all of those people in Washington, D.C., and yet none of those cities—Chicago—had that many arrests, Los Angeles was way far beyond what you saw in any of those cities. And then—that happened in November—they decided only to prosecute about 20 people, which was less than 9 percent of the people whom they arrested. And when we look at who they prosecuted, you find that they were all the Black Lives Matter members who were arrested. You find that they were people that were associated with known groups and organizations that were speaking up on behalf of black lives. It was clearly targeted. It wasn’t just—you know, people who threw bottles at police officers were not tried, were not put on—had no charges against them. And yet, folks who engaged in nonviolent, peaceful protest found themselves in positions in which they were actually being tried as criminals. NANA GYAMFI: It was really fascinating. We thought—you know, you have the conspiracy, and then you feel the real thing. And we found that Black Lives Matter folks had been chosen based upon surveillance that had been done, that the Los Angeles Police Department and the City Attorney’s Office have this political prosecution unit, that’s sort of informal, that started with the Occupy movement and then got bumped up with the Black Lives Matter movement, in which they gave officers overtime, carte blanche, to go through all of social media, Facebook, Twitter, all the different—Instagram, everything they had at that time, and spend hours taking snapshots of people and then matching them with names and then following that up by following people’s social media. People’s phones were tapped. All of these different types of surveillance that we expect to be used in an antiterrorist way were being used against Black Lives Matter movement folks. AMY GOODMAN: They’re not convicted. They are arrested. And these are the letters—and who sent these letters? NANA GYAMFI: These letters, according to the letters themselves, they were either sent by the DOJ or LAPD. We are certain they were sent by LAPD. The Department of Justice of the state of California, this is not what they’re doing. This is an LAPD thing. And they sent—now, these folks weren’t even charged. We’re talking about they’re not even having cases against them in court. Just based on their arrest, we had a person who was headed to Canada, who was sent back and told—deported—at the border, “You can’t come in here because you have these charges pending against you,” when that clearly was not the case, but it’s being written up purposefully and intentionally to mar any people who are associated with the Black Lives Matter movement. NANA GYAMFI: Yes. And she describes herself as a political prosecutor. She is one who prosecuted Occupy Los Angeles members who were arrested. If you look her up, there are vociferous blogs talking about the tactics that she engaged in, the city attorney engaged in. And that—those tactics were used again here with Black Lives Matter. Just as an example, her offers, in terms of plea offers, all included jail time and a “no unlawful protesting” clause. Now, I pointed out to her, in open court and to the judge, that I find that to be completely unconstitutional. I don’t know what that means, “no unlawful protesting.” Protesting is a First Amendment right in this country. And she, you know, looked over and said, “Oh, well. That’s what they’d have to plead to.” And so, obviously, we were not going to plead to that. MELINA ABDULLAH: I did not—as far as I know. But then there’s also, the employers don’t have to share with you whether or not you received a letter, so I’m not sure, but I’m hoping that I did not. AMY GOODMAN: Before we go, I wanted to turn to one other case that Black Lives Matter-L.A. is looking into. Wakiesha Wilson was in LAPD custody on March 27th, when authorities say they found her hanging in her cell. Wilson died at a hospital an hour later. Wakiesha Wilson’s mother, Lisa Hines, did not learn about her daughter’s death until days later, when Wilson did not show up in court. This is Lisa Hines speaking at a news conference last week. NANA GYAMFI: I think that—I think it’s very important that there is an investigation, that there’s an independent investigation, that it’s not just an LAPD investigation, and that the city of Los Angeles put the money behind doing that. You can think about how much money was spent on the cases that we—the case we just talked about with the six, and you think about them thinking about trying these cases again? That monies that are going to that, those tens of thousands of dollars, should be going to find out who killed Wakiesha Wilson and to prosecute those people. AMY GOODMAN: We’re going to leave it there, but we will continue to look at this case and so many others. Nana Gyamfi, I want to thank you very much for being with us, attorney representing Black Lives Matter-Los Angeles, professor of Pan-African studies at California State. And Melina Abdullah, I thank you for being with us, activist and Black Lives Matter activist, professor and chair of Pan-African Studies at California State U., L.A. Seven Decades Ago the U.S. Detained 120,000 Japanese Americans, Could It Happen Again? NEXTSeven Decades Ago the U.S. Detained 120,000 Japanese Americans, Could It Happen Again?